There are many snake lovers all over the world who love pythons and boas, and since I've been writing for kingsnake.com, many of them have contacted me to ask that I write about Indian pythons and boas. So this post is for my python and boa-loving readers! In India, you can find all kinds of snakes, from the smallest 20 cm worm snake to the largest reticulated pythons, from sea snakes to flying snakes. India is home to three species of sand boa, and the common sand boa, Gongylophis conicus, is one I frequently encounter on rescue calls. The other two are the red sand boa (Eryx johnii) and the Whitaker’s sand boa (Eryx whitakeri), which is named after the renowned Indian herpetologist Romulus Whitaker. The common sand boa is also called the rough-scaled sand boa because of its rough, scaled body. If you’re a touching a common sand boa’s tail you can get a feeling of rubbing a crocodile's back. A common sand boa’s body is thick and fat. It has small, keeled scales on head, and the tail is short, blunt and rough. Eyes are small with vertical pupils, and nostrils are placed high on the head. Ventral scales are narrower than the width of the body. It is sand coloured or brown with darker brown blotches. The old time rescuers who did not have a book or Internet to refer to used to mistake it for a young Indian rock python or Russell’s viper. Found in sandy areas, it prefers to live in crevices and burrows. A short-tempered snake, it coils and hides its head under its body when disturbed, and when provoked strikes with a jerky movement. Otherwise, it's a slow moving snake. 100 cm is the maximum length. Sand boas are viviparous by nature. Once I had rescued a female adult sand boa snake and was carrying it in a snake sack to the releasing area . When I opened the sack to release this snake, I see to my surprise she had given birth to eight young ones! They were so cute and fat, as if they were working out in their mom’s womb. It was really a new and unforgettable experience. A recent study from the National Autonomous University of Mexico (UNAM) shows in 1998 there were 6,000 axolotls per square kilometer in Xochimilco. By 2008 that figure had plummeted to 100. And in 2014 researchers found less than one per square kilometer. There are at least three major causes for its decline: urbanization, water pollution and the massive invasion of exotic predator fish like carp and tilapia, introduced by the Mexican government in the 1980s to help feed local communities. From the first few thousands they introduced, there are now an estimated 900 tons of fish in these canals. One of the turtle species that Ron and I encountered on the Colima trip was a semi-aquatic creature of primarily terrestrial habits. Known as the Mexican spotted wood turtle, the subspecies we happened across was Rhinoclemmys rubida perixantha, the more northerly of the 2 known forms. We encountered 3 of this (as we later learned) uncommon little chelonian. All of these little brown turtles seen were active at night in a flooded field just east of the city of Colima. The most conspicuous things about these turtles were the intricate and busy head patterns of broad, dark edged, yellow bars and spots. Although the yellow head patterns precluded R. rubida being mistaken for R. pulcherrima, at 6 to 8 inches in length the former were also of smaller size. Very little is yet known about the diet of the Mexican spotted wood turtle. It is thought that like others in the genus the species eats a good amount of vegetable matter and is an opportunist feeder on invertebrates. It is known that captives relish worms, caterpillars, and land dwelling molluscs. Hopefully, as the Behler Center works with their group we will learn more about this beautiful and delightful turtle. Continue reading "Bright spot: beautiful Mexican wood turtles"
Big Mama! 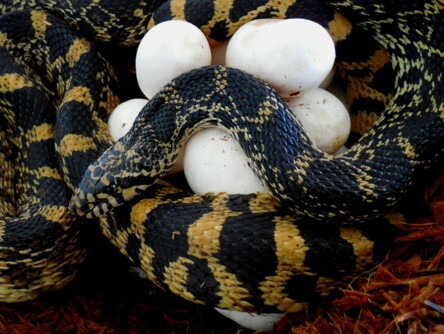 This Kankakee County bull snake shows off her natural instinct to protect her eggs in our herp photo of the day, uploaded by kingsnake.com user pitparade! Be sure to tell pitparade you liked it here! The saw-scaled viper, Echis carinatus, is a venomous snake found in India and the smallest member of the Indian "Big Four" deadly snakes of India. This pygmy snake is one of the fastest-striking snakes in the world, and definitely the fastest striking one in India. The thing I like best about this tiny creature is that when the saw-scaled viper is disturbed, it coils and rubs its saw-like scales together to make a noise like a wood-saw. They are hemotoxic by nature as they are from viper family. Another species of saw-scaled viper found in India is the Sochurek’s saw-scaled viper, Echis carinatus Sochureki, which is found in some western and central parts of India. The saw-scaled viper's body is pale brown with a white-bordered zig zag pattern. The body is white underneath with tiny brown spots. Small scales are present on head, and a white or pale brown spear mark on top. The eyes are large golden with vertical black pupils, and the body is rounded and has scales with saw-like keels. The tail is short. Saw-scaled vipers are commonly seen in coastal areas and they are found under boulders and thorny bushes. Though nocturnal, they may be seen basking in the morning. They feed on scorpions, centipedes, and geckos. Viviparous by nature, they give birth to 4-8 young ones. Usually there are few saw-scaled vipers in my area, but whenever I find one while herping, I am eager to hear the wood-saw noise. I find these tiny creatures very beautiful and attractive, but I always avoid bare-hand handling them. Sexually dimorphic species are less likely to go extinct, according to new research. By examining research on global patterns of amphibian diversification over hundreds of millions of years, De Lisle and Rowe discovered that “sexually dimorphic” species – those in which males and females differ in size, for example – are at lower risk of extinction and better able to adapt to diverse environments. Their work suggests the ability of males and females in sexually dimorphic amphibian species to independently evolve different traits – such as size – helps them survive extinction threats that kill off others, says De Lisle. He says classic ecological theory would not have predicted that about amphibians, a class of vertebrates that includes frogs, toads, salamanders, newts and caecilians. The conventional school of thought believes different-sized sexes of the same species take up more resources and are less able to adapt and diversify than species where ecologically relevant traits like size are basically the same between males and females.